Go Marsha! I’m loving her single artist comeback and this video really shows how beautiful she is inside and out. I’ve watched a few ustream videos she has done and she is such has so much charisma and passion for her music so I’m happy she decided to make a visual with her latest single “Far Away”. In this video it tells a story of two brothas who share a love for eachother and it’s not accepted in their community. The ending is definitely a harsh reality. If you know someone or are a victim of bullying in anyway, please do your part and share this video with others. Kudos to Marsha. I was walking in Piedmont, California today and noticed the cutest couple, romantically strolling in the park with their baby carriage. Her natural locs were woven into a large bun that so elegant rested on top of her head as He had a stretched out dark haired afro with piercing on his eyebrow and ears. I immediately caught their essence of black love as I secretly ate my pizza while trying to stare. Usually I would compliment that woman on her hair, ask her about products and conduct business but I just watched. In amazement. It’s not every day that me, as a black woman, gets to experience young love outside of my parents house. My mom and pop are perfect examples of what I want my love to be like when I get older, but what about now? As a young woman completing yet another chapter in my life I’ve always wondered about who will be in my next chapter. I’ve been on the natural journey for two years now and I have been single in the process. I value the friendships I’ve kept and made who stand by every natural curl that I create. But at age 22, you don’t get any younger. All the days will seem to mush together if you don’t live them properly and pretty soon I will be barefoot and pregnant. Yikes! 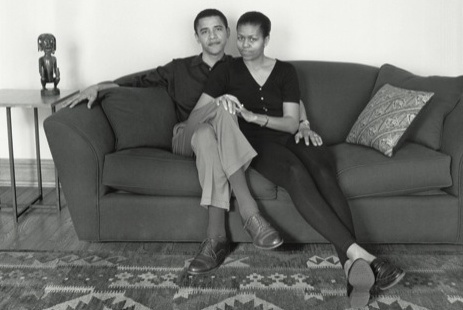 I took this photo from www.blackloveposter.tumblr.com because it’s not only just “Obama Love” but inspiring to me and hopefully all black women that there is a man standing behind your individuality and will love every bit of you no matter the circumstance may be. And in this case, presidency didn’t get between their love. Black Love Poster is a blog that celebrates black love between women of color. I have seen posts on lesbian couples, black women with white, African, Asian, Latino, all races. Some are sharing the Naturality and some are embracing the beauty of just being black. I think it’s wonderful and I hope that will not only give my single black women hope but also every woman that LOVE does exist.